Python script to find programming language which pays biggest salary in Slovakia job market? I will try to answer this simple question using google colab + python notebook + web crawling Slovak job ad site + simple NLP (mainly using regex and simple text transformations) and pandas with sklearn. It's impossible to answer this question using something like TIOBE programming index. This index is composed using trend searches in popular search engines. It doesn't take into consideration what is actual demand for some programming language on job market, let alone niche market like Slovak. This is possible now due to change of law on Slovak job market, which basically force companies to publish lowest possible salary they are willing to pay for position. Companies tends to put higher figures in ads, to compete with each other. So real salaries are bit higher, but it should average itself out. There is one problem tough. There is no regulation what type of salary they should put on ad, so there are companies that put net salary and other put gross salary. But. there are not so many of those that put gross salaries. For correctness, jobs with salary lower than 900 and bigger than 5500 EUR will be ignored, because there is higher probability they are false positive. We will use corpus of words that will represent most popular programming languages. There will be tree different strategies for parsing programming languages from ad text. You shouldn't worry to much about this. Main reason for this it's difficulty to parse words like "C" or "R" programming languages from ad text, so we must treat it as single word that have no word boundaries. As you can see there are some interesting surprises. Java is main language to learn if you want to make between 3000 and 4000 Euros. It no surprise that for higher salaries than 4000 EUR there is no clear winner. You must be generalist at these positions (Architects, Team Leads, Tech Leads). So answer to the question in title is: None, or there is not silver bullet, just be good at what you do and make sure to learn as much as you can. Do you know what SOLID (not solid, but S.O.L.I.D) object-oriented design stand for? It stand for: Single responsibility, Open-closed, Liskov substitution, Interface segregation and Dependency inversion. Rigidity - It is hard to change because every change affects too many other parts of the system. Fragility - When you make a change, unexpected parts of the system break. Immobility - It is hard to reuse in another application because it cannot be disentangled from the current application. Finding this kind of bugs is like art and you need lot of experience to be good at it. That's why some of programmers specialize in Java profiling. In some cases fining bug is impossible if you don't know how system works. Every Java programmer should know at least what are basic profiling tools, because you can't always pay some external specialist to fix memory leaks or deadlocks for you. This is internal Java tool and it is not profiling tool as such, but it is very useful. Oracle describes jmap as an application that “prints shared object memory maps or heap memory details of a given process or core file or remote debug server”. And it is exactly that. 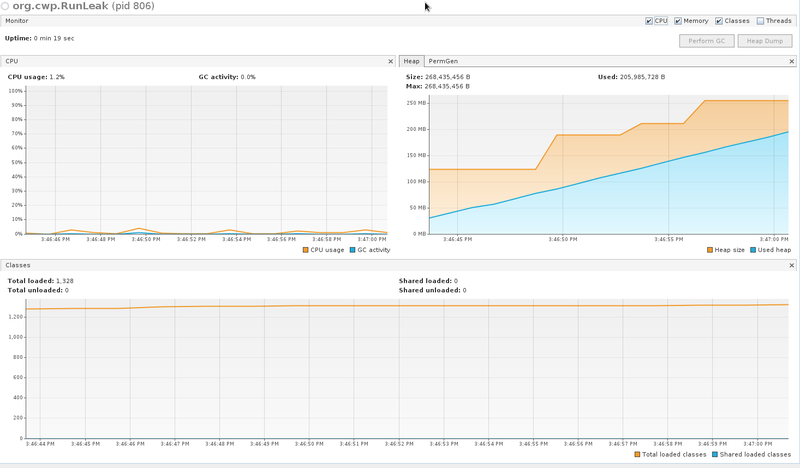 Most useful option is to print memory histogram report. The resulting report shows us a row for each class type currently on the heap, with their count of allocated instances and total bytes consumed. Using this report you can easily identify memory leaks if you have any. JStack is also not profiling tool, but it can help you identify thread deadlocks. The output of "jstack" is very useful for debugging. It shows how many deadlocks exist in this JVM process and stack traces of waiting threads with source code line numbers, if source codes were compile with debug options. 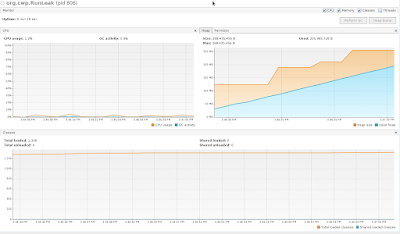 JConsole is a graphical monitoring tool to monitor Java Virtual Machine (JVM) and Java applications both on a local or remote machine. 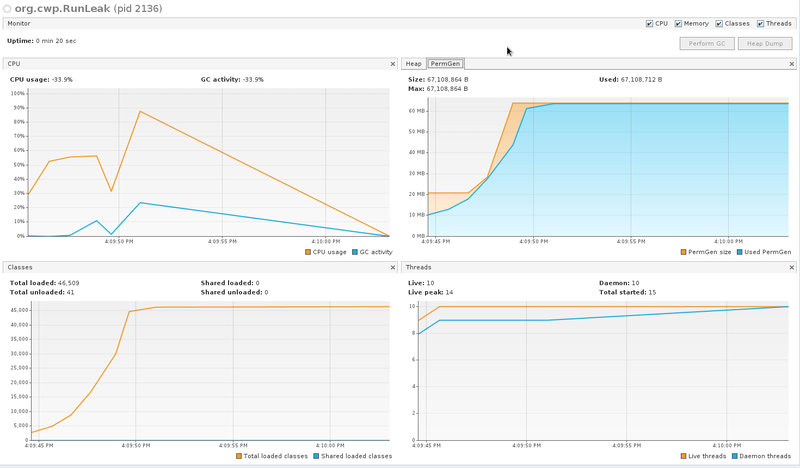 It is using for monitoring and not profiling, so you are better with using VisualVM described bellow. Another tool currently built into the JVM is VisualVM, described by its creators as “a visual tool integrating several command line JDK tools and lightweight profiling capabilities”. This tool can generate memory graph that will show you how your application is consuming memory through time. 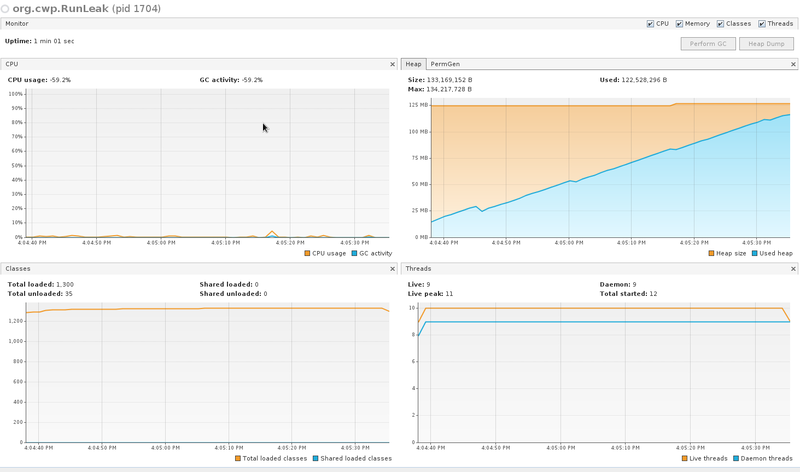 VisualVM also provides a sampler and a lightweight profiler. 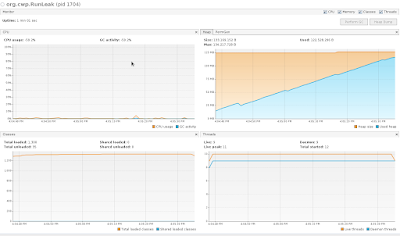 Sampler lets you sample your application periodically for CPU and Memory usage. 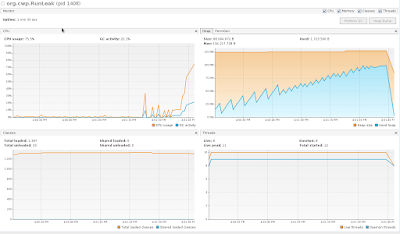 It’s possible to get statistics similar to those available through jmap, with the additional capability to sample your method calls’ CPU usage. 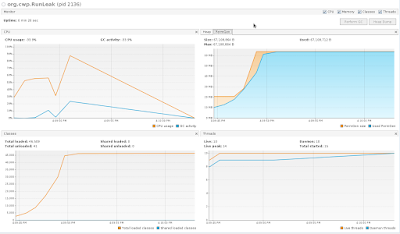 The VisualVM Profiler will give you the same information as the sampler, but rather than sampling your application for information at regular intervals. 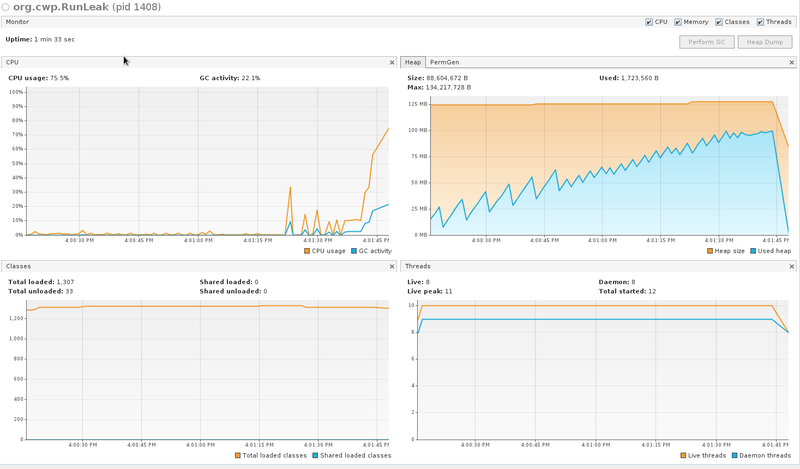 For me these built-in tools work quite well, but if you want more specialized and more powerful tools for profiling you can check: BTrace, EurekaJ and Eclipse Memory Analyzer (MAT).